"I'm so glad I live in a world where there are Octobers", as Anne Shirley once said. And this October, more than any other, my heart is gladder than glad to be bringing you Return to Green Gables! Rachel of Hello Chelly, Hannah of So Obsessed With & I have been scheming about this event for ages, and it's such a thrill to finally be able to share it with all of you. Be sure to make the rounds on all three of our blogs for the rest of the week in order to see all our posts, each and every single one inspired by or tribute to the classic Anne of Green Gables. I'm a lucky girl who grew up with a pretty conventional family - a father, a mother, two sisters. I even found myself surrounded by extended family on all sides, and I lived in a comfortable, happy, secure world where I knew I belonged, and I knew I was loved. But not all people are so fortunate; Anne Shirley is a prime example. 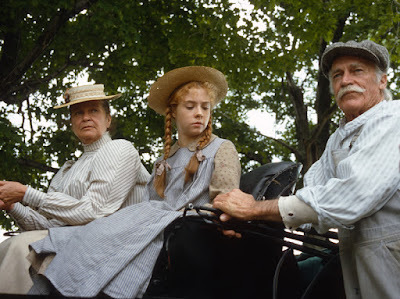 When we first make her acquaintance, it is a fact that Anne Shirley is an orphan. She has no family, no place to belong, no home. But slowly, as the series continues, this changes. Anne goes from being one lonely girl to being surrounded by a large, loving clan. It's one of my favorite aspects of her story: how Anne finds and has a family to finally call her own. Early on, it is clear that one of the special things about Anne's newfound family is that they choose to make her a part of their lives. Best example? Matthew and Marilla, the brother and sister pair who adopt Anne. Anne wasn't what they were looking for initially, but something about her appealed to their instincts, and they choose to keep her. While they are plenty of shenanigans to follow as they learn how to be to and around each other, there's never any doubt that they regard each other as real family - encouragement, education and entertainment all in one package. It's a pattern that often repeats itself in the series, as Anne crosses paths with many other individuals whom she comes to cherish as family. I truly loved seeing Anne find her family, discovering kindred spirits that she comes to love as much as if they were her own blood. As I reread the series, I found myself deeply appreciating how the definition of family didn't waver. It doesn't matter whether we talk of Anne's adoptive, chosen family (Matthew, Marilla, Dora, Davy, and Mrs. Lynde) or her own clan (Gilbert, her children, and Susan); they shared the same core qualities. Encouragement. Support. Strength. Education. Friendship. Admiration. Inspiration. Joy. Challenges. Mistakes. Belonging. Refuge. While things might not always be easy, or even happy, family is defined by all those things. Family, as I've witnessed it in Anne's life, is constant. No matter where you go, or what you do, having these people who love, understand, cherish you - well, it's the very best thing in the world. And that is why family - whether blood or choice - is always going to be important. Don't forget to check out Rachel's post about friendship + Hannah's post about love! And come back tomorrow to check out some more favorites.